Red-footed tortoises show gender, regional and individual variations in color, shell shape, and minor anatomic characteristics. Adult red-footed tortoise carapaces are generally an elongated oval with sides that are nearly parallel, although the sides of males may curve inwards. They are fairly highly domed and smooth with a rather flat back. Males are usually slightly more colorful than females, and colors vary by region. Hatchling and young red-footed tortoises have much rounder and flatter carapaces that start off as mostly pale yellow to brown. New growth adds dark rings around the pale center to each scute. Redfoot tortoise enclosures require a sturdy wall at least 0.4 meters (16 inches) in height above ground, as well as a few inches below ground, to prevent (or discourage) these tortoises from digging. Red-footed tortoises aren’t usually burrowing or digging tortoises, so this isn’t as much of a concern as it would be with other tortoise species. See-through fences and walls should not be used, as the tortoises tend to try to escape through or over these walls if they can see the other side. Young red-footed tortoises can be raised indoors if the outside conditions are beyond their tolerance. While outdoor housing is preferred anytime the temperatures are in the acceptable range, many people raise their red-foots indoors for the first few years. Probably the best enclosures to use indoors are simple, plastic sweater boxes or a “tortoise table,” which you can buy or make yourself. The container itself isn’t as important as the furnishings put into it, which include substrate, lighting, temperature gradients and cage furniture. In colder climates, a suitable enclosure can be built in the garage for large tortoises during the winter. These enclosures should be heated enough to keep the tortoises comfortable during the indoor months. I also include a few large, flat rocks in the enclosure. They help file down the tortoises’ nails and give them a clean surface for food. We have hide boxes for all tortoises indoors or out, usually multiple in wetter and dryer areas. Indoors is a good practice to have also hides in both warm and cold area of the enclosure in order for the tortoise to be able to thermoregulate. Indoors, redfoot tortoises can be maintained at normal room temperatures: 20 to 27 C (68 to 80 F). They should also have a basking area heated by an overhead light or a ceramic heat emitter. This warm spot should be in the 32 C (90 F) range. While some don’t think it’s needed, we provide a UVB light in the indoor enclosures to help them properly process the calcium in their diets. When placed overhead, it will not lead to eye damage as is sometimes claimed. Lights should run 12 to 14 hours a day, and a mild heat source can be used 24/7 under or over the hide box area (small heat pads, red bulbs or ceramic heat emitters work great for this). Lamp timers make the light cycle consistent and easy. Redfoot tortoises that live outdoors are tolerant to various temperature ranges. High temperatures are generally not going to be a problem provided that the tortoise has a shaded area to escape to if desired and constant access to water to soak in and drink. Redfoot tortoises should have water dishes or small ponds in their outdoor enclosures. We use shallow, low-sided dishes that are glazed to make cleaning easy. We provide water dishes to our red-footed tortoises all year, although their use of them in the winter is very minimal. We also provide small “mudholes” and puddle-areas that the tortoises can sit in to stay cool during the hot months. When redfoot tortoises are housed indoors, shallow water dishes can be used. Redfoot tortoises are typically eager eaters, rarely turning down a meal. With adult tortoises, we feed them the best mix possible of various fruits, veggies, flowers and leaves. They will also graze on mulberry leaves, grape leaves, hibiscus leaves and flowers. They enjoy Mazuri tortoise diet as much as any tortoise does, and having this on hand works well for a backup plan if you can’t get to the store for fresh greens, and it is a good supplemental diet. Mazuri tortoise diet works well to cover any of the nutritional bases that the other diet may have missed. We also use spring mixes (particularly with baby red-footed tortoises), which have several leafy ingredients in them, and we supplement with kale, collard greens, turnip greens and any of the darker lettuce types. Cactus pads have become a major part of the diet of many of our tortoises as well. Variety is the key. It is generally thought that red-footed tortoises need more protein in their diet than many other species. While we don’t offer ours a direct source of protein, they probably do take the opportunity to eat an earthworm or a grub if they come across them in their enclosures. Some keepers offer insects as a supplemental food source (waxworms, mealworms, superworms or earthworms). Some even offer baby mice as a protein source in the diet of their captive red-footed tortoises. Mazuri tortoise diet is higher in protein than a normal vegetarian tortoise diet, so by using this in the diets of our tortoises, we think their needs are being met. Feed tortoises from a grass surface, flat rock or concrete, or from a tray. Tip: Light-colored trays stay much cooler in the sun and prevent the food from drying out as fast. To prevent them from eating soil or rocks, never feed tortoises directly from a gravel or dirt surface. We lightly supplement the foods of any younger tortoises with a calcium as well as multivitamin powder to cover any nutritional gaps that might be present in their diet. Adults generally don’t need much additional supplementation in their diets. Redfoot tortoises are grazers and will munch on any plants in their enclosure. We like to use various hibiscus, palm trees and clump grasses in our enclosures to provide them with a somewhat renewable food source. Contrary to what many sellers tell customers, tortoises generally should not be handled with any regularity. They are easily stressed when over handled, and children tend to drop them when spooked. These stress factors can lead to a decline in a tortoise’s activity levels and health. Juvenile and older red-footed tortoises are generally more resistant to handling, but all tortoises should be handled carefully. Avoid pinning them down or restricting them. Allow them to carry on in their intended way, especially when they’re young. Older red-footed tortoises are usually pretty tolerant of people. Cleaning must be done on a regular basis, as most tortoises tend to soak in their dishes and defecate in them. General cleaning is on an as-needed basis. Indoor enclosure don’t need a lot of cleaning unless there are too many tortoises in the enclosure. We change indoor substrate a few times per year on average. In shallow water, the tortoises usually begin drinking immediately and flush their systems at the same time. Baby and juvenile red-footed tortoises tend to dry out much quicker than larger, more established tortoises. They can also be soaked outside the enclosure in shallow, warm water once or twice a week for 15 to 30 minutes to get fully hydrated, which also helps keep the main enclosure clean. This is a form of “forced hydration” but works well in keeping the tortoise fully hydrated. These tortoises can suffer from most common reptile health problems, but respiratory infections and parasites in the case of imported tortoises are the most prevalent. Redfoot tortoises can also be prone to respiratory infections if they are kept in cool or wet enclosures. 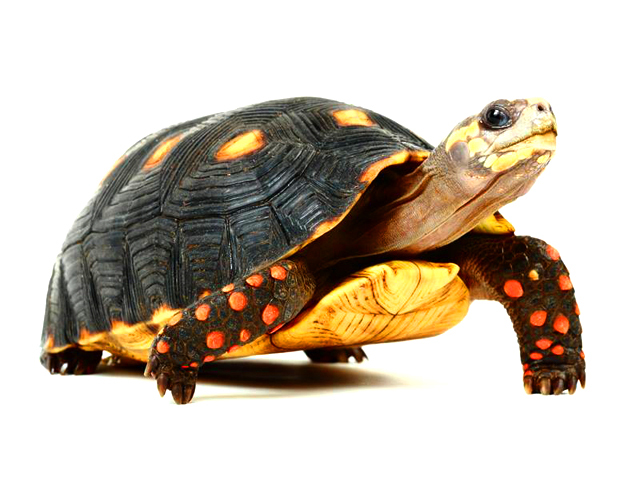 This is evident if the tortoise has a bubbly nose or raspy breathing or makes a gurgling sound as it breathes. In the early stages, it can sometimes be corrected by raising temperatures and lowering humidity for a week or two, but if it gets to the point of bubbling or foaming at the mouth or nose, a vet should be consulted.